Get affordable Security Camera Installation on Maywood, CA and CCTV equipment with commercial quality and 2 years warranty. Protection4Less offers leading technologies in security cameras like: TVI and IP cameras. High-Definition Transport Video (HD-TVI) is the top technology the latest HD Analog technology. HD-TVI security camera technology is capable of transmitting 2 megapixels (1080p) or 3 megapixels of HD video over standard coaxial cabling up to almost 500 meters. Protection4less HD-TVI recorders are compatible with standard analog, and they can even be connected to IP cameras through network router. TVI technology is becoming the standard of the security camera industry, is reliable and stable. IP cameras is becoming the most used technology for high definition security camera. This camera can be wired or wireless. Wireless IP camera can work with the Wi-Fi signal of the router providing an easy and secure connection on high definition resolutions. This camera is used when a wire can’t be connected directly from the camera to the NVR. The best way to get perfect picture with no issues is a wired camera, Protection4less uses Wi-Fi technology security camera only when is complete necessary. 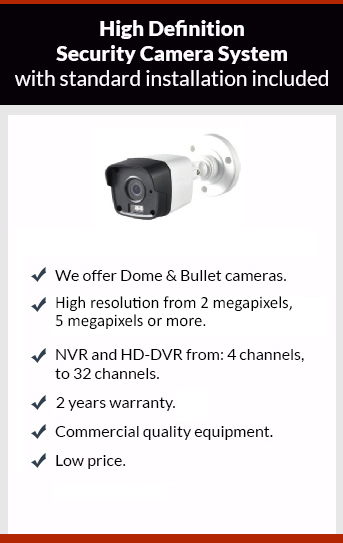 Protection for less has a definitive solution of their customers with top technologies on security cameras. Give us a call the estimate is free.